You will FOREVER be a part of a team. You have to learn to embody compassion for others. Learn to acknowledge your weaknesses and accept others’. Understand this is what makes a team powerful…we can’t all be good at the same things. Let others shine, teach and build a culture of sharing. 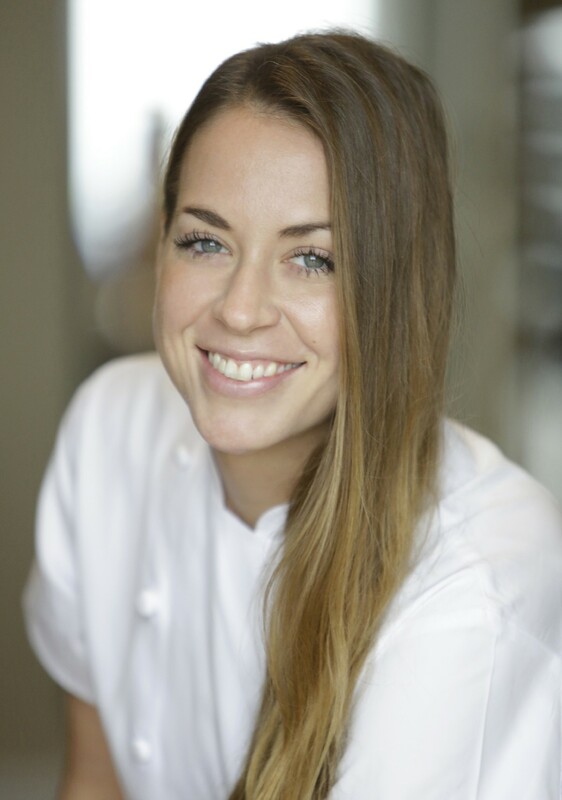 I had the pleasure to interview Chef Hilary Henderson. 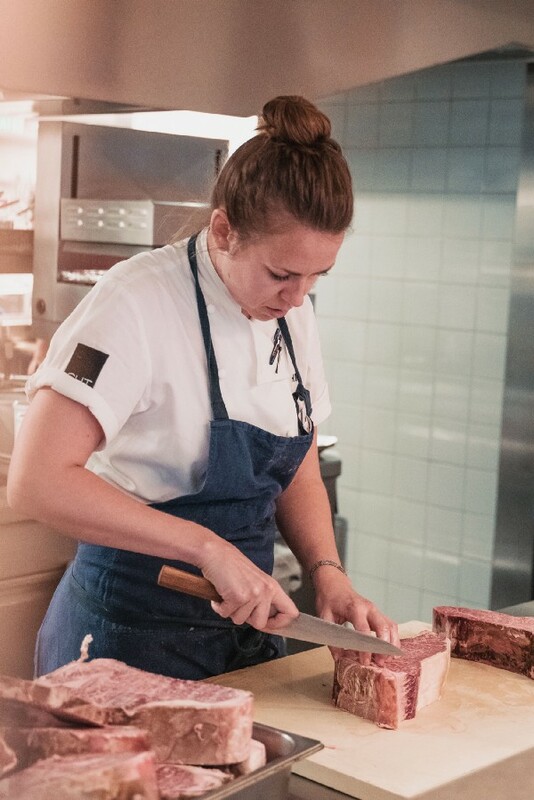 Hilary brings a unique talent and a fiery passion to CUT by Wolfgang Puck Beverly Hills. As the Chef de Cuisine, Henderson is the face of the restaurant’s open kitchen. 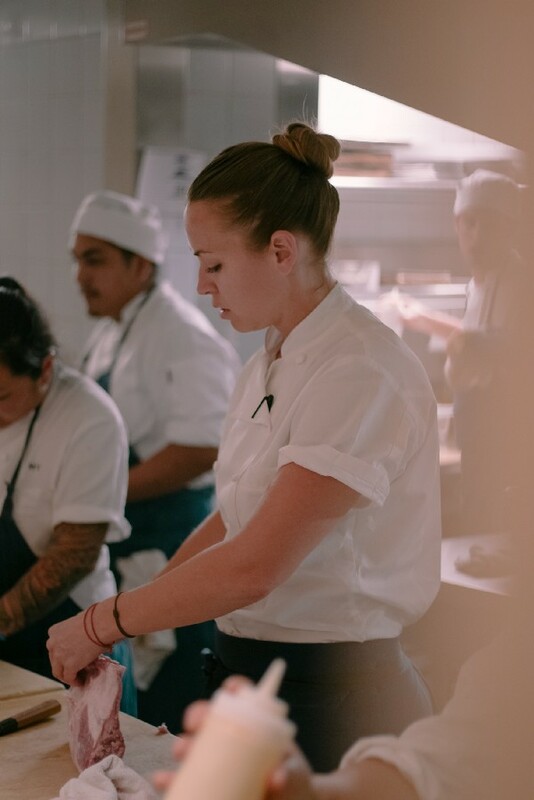 Here she creates standout specials from seasonal California products and leads her team in delivering an exceptional dining experience at this exclusive steak restaurant in the famed Beverly Wilshire Hotel. Born and raised in Morgantown, West Virginia, Hilary attended the Art Institute of Pittsburgh. Learning came easy to Hilary and it did not take long for her to fall in love with the idea of cooking professionally. After completing school, Henderson took her first position at the famed West Virginia Greenbrier Resort. Henderson joined the Wolfgang Puck Fine Dining Group in 2008 as a cook at The Source in Washington, DC. The high-powered pace of this political city helped hone her skills in a busy kitchen. It was during this time that she learned the importance of “back of the house” and developed exceptional management skills. Most importantly, she learned how to shape a culinary experience that would invite, excite and satisfy her guests. In 2011 Hilary accepted the position of Sous Chef at Wolfgang Puck’s Beverly Hills premier steak restaurant, CUT. Working in “Hollywood” she quickly learned that her passion for food now needed to grow to feed an experience that would entertain. She welcomed the challenge, and both Wolfgang and the press took notice. 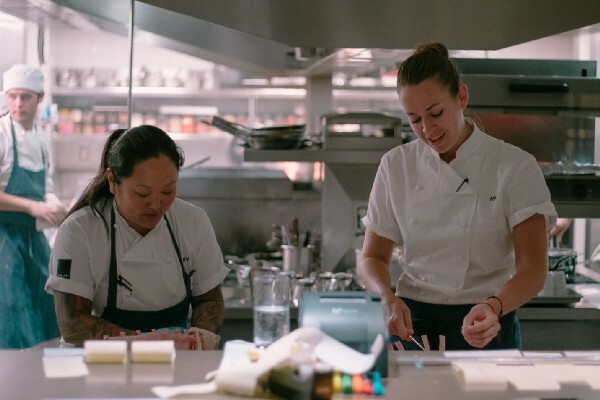 In 2016 Henderson was named Chef de Cuisine at CUT. With her intuitive ability to understand the local landscape, she developed Petit CUT, an intimate private dining room for entertaining special occasions, power dinners, and executive meetings. 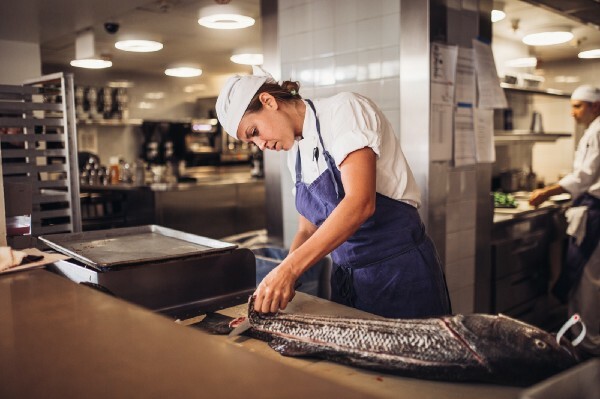 Henderson’s loves the outdoors and her weekly trips to the Santa Monica Farmers Market where she handpicks the best local ingredients for CUT’s dining and special events. Her international tasting series focused on the cuisines of Argentina, Italy, and Japan delivers a culinary experience like no other. Hilary is naturally funny and infuses high energy with a determined spirit. When she is not in the kitchen you will find her on a West Coast beach soaking up the sun and surf. Thank you so much for doing this with us! Can you share with our readers a story about what inspired you to become a chef? I really had no idea that I ever wanted to become a chef. I just liked to cook and the joy I found in the kitchen at home growing up inspired me to enroll in culinary school after attending a liberal arts college for a year (where I couldn’t commit to choosing a major because it just felt like too much pressure at the time). I liked culinary school and I started working in a small restaurant in Pittsburgh called Le Pommier. I loved everything about it. I eventually left Pittsburgh to gain different experiences and found myself up and down the east coast before I landed in Los Angeles. It’s in LA I really discovered what it means (and what it takes) to be a chef. Well, I’m the chef of a steakhouse so I know a good deal about a lot of meats and grilling techniques and though it’s technically my specialty, I’m very inspired by the many colors of food…after all, it is nature. I love making bright, neatly composed dishes. I think I’m most drawn to colors because I’ve also enjoyed oil painting as a hobby for a long time. I had to prepare a 5-course tasting menu to be paired with Scotch whiskey for a group of 20 people. I’m terrified of speaking to a crowd of strangers, but I introduced the menu to the room, voice quavering, hives emerging…. and this was how I met my boyfriend. I stumbled upon a quote from John Wooden as a young cook and still reference it often, “success is peace of mind which is a direct result of self-satisfaction in knowing you made the effort to become the best of which you are capable.” I love this quote because it is a reminder to be determined toward success in so many aspects of life — every single day and just coming to peace with what is satisfying FOR YOU. Being considered successful is not something that is achieved over a lifetime but something you are committed to in small ways every single day. When I started cooking professionally, I was in culinary school and had no idea what I was doing. I began my journey in a very tough kitchen at the Greenbrier Resort in West Virginia. In my first week, I remember crying as I walked down the sidewalk at midnight while it started to rain, thinking “I don’t know if I can do this”. I had been an athlete for the better part of my youth but was not prepared for 10–12 hours of constant motion, on my feet while the people around me were constantly expecting me to be fast and do more and who were all, as I saw it, expecting me to fail. I recall someone asking me why I wanted to start cooking when I was just going to be “little Suzy homemaker” for the rest of my life. That was just the beginning and a lot has happened since then that has seemed even harder. Being a chef is a very demanding and often challenging job, physically, emotionally and mentally. The drive to continue comes from realizing nothing ever gets easier… actually, things get harder the more you grow and the more you take on, but you push through by understanding how to handle yourself and how to handle situations that arise and know that being committed to the grind always produces results. 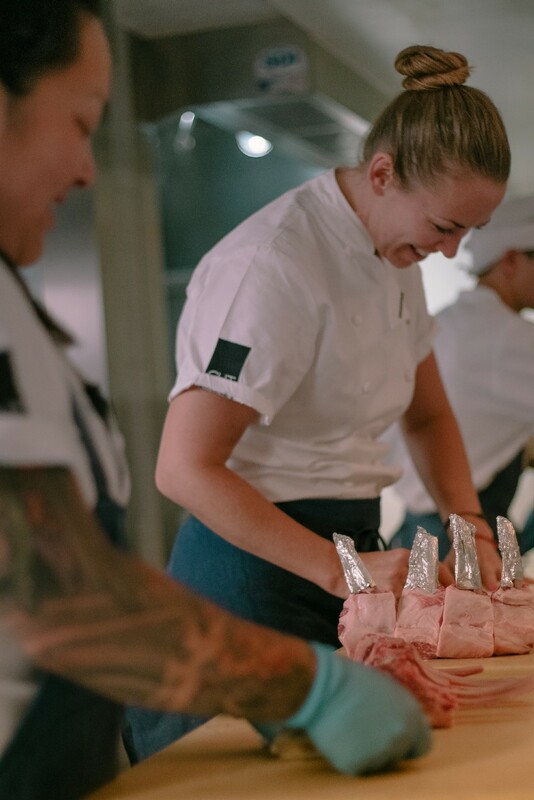 I had to accept that I was committed to the “grind” but that being a chef is what I have chosen to accomplish professionally and, more importantly, that anything worth doing will be challenging. Accepting this forced me to look inward for the answers to challenging situations and understand my own personal depth. Once I understood I had the capacity to provide solutions for myself and for others I started to stand in my own power and I think I’ve only just really started to wield that power. I’m working on that “power” and really enjoying leading a team. I’ve always considered myself a creative person but I discovered how hard it can be to balance creativity and “responsibility” and the difference in creating because I have ideas and how impossible it can feel to be forced to create. 2) Learn to express your needs and communicate with all kinds of people. You won’t be able to hide behind your food or your ego forever. 3) Food will not always be your priority. You have to learn to expand to fit the needs of the operation. You might have to focus your attention on things you never realized were a part of the day to day operations. Today, a chef has to be much much more than the sum of the ingredients on the plate. 4) Be humble and learn the parts of the operation you don’t know. This means you will have to admit to someone “I don’t know how to do that”. Trust me… do this sooner than later. There is much more to a restaurant than whether or not your prep cooks finished the list you left for them. 5) You will FOREVER be a part of a team. You have to learn to embody compassion for others. Learn to acknowledge your weaknesses and accept others’. Understand this is what makes a team powerful…we can’t all be good at the same things. Let others shine, teach and build a culture of sharing. Learn to take feedback and appreciate those who are willing to give it. In your experience, what is the key to creating the perfect dish? Understanding that creating a dish doesn’t happen on the first try. You must understand your content and respect the ingredients then work through several drafts. Practice restraint and always let someone whose perspective you admire “proofread” the drafts before you send it out into the world. Practice being kind every day and learn to take care of each other.